G4K Winner Boy Rescue Game is another point & click escape game developed by Games4King. A winner boy is living in a town. The winner boy is very trivial and playable too. The winner boy went to the game one day and got into a palace. It is your duty to save that winner boy from there. 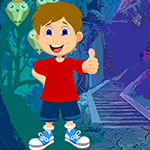 Save him by finding clues and solving puzzles.Good Luck and have fun! Thanks, this was a nice game.